In conjunction with Luna, Inc. and engineers at the Air Force Corrosion Prevention and Control Office, researchers at the Air Force Research Laboratory have developed a new corrosion and coating evaluation system, CorRES, that can measure the ability of coatings to protect aircraft structures by using sensor panels that measure localized changes during corrosion testing. Unlike conventional coating tests that rely on an expert’s visual evaluation of a test panel at the conclusion of a test cycle, the CorRES takes measurements throughout a coating’s test and transmits data in real-time to a base station for evaluation. Ultimately, the test will reduce costs associated with coating materials development and implementation through better data and understanding. As next-generation material development drives advances in Air Force technology, understanding the ability of new materials to perform in the operational environment is paramount to transition success. 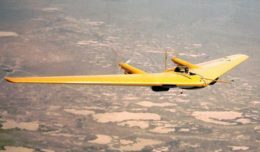 This is particularly important to scientists working to develop new, high performance Air Force coating technologies that meet strict environmental compliance needs in diverse operational conditions. Through a small business innovation research project with Luna Innovations Inc., scientists at the Air Force Research Laboratory and the Air Force Corrosion Prevention and Control Office supported the development of an improved system for coating materials performance evaluations that will accelerate the screening, qualification and implementation of new aircraft coatings. The new corrosion and coating evaluation system, CorRES, measures the ability of coatings to protect aircraft structures by using sensor panels that perform electrochemical measurements during corrosion testing. Unlike conventional coating tests that rely on an expert’s visual evaluation of a test panel at the conclusion of a test cycle, CorRES records corrosion rate data throughout a test and transmits the data to a base station for evaluation. This enables researchers to know not only if a coating fails, but exactly when this occurs during a test. “Legacy systems do not produce time-based, quantitative measurements inside of the test chamber, but rather, these are taken after a panel is removed. There’s a lot of variability in corrosion tests, and CorRES allows us to monitor this variability and provides quantitative data that help us better understand a coating’s performance in the lab so we can project how it will perform in the operational environment,” said Hunter. Aircraft coatings are the first line of defense when it comes to mitigating structural corrosion of an air platform. As new coatings are developed, particularly those that contain non-chrome primers, there is a need for researchers to qualify the coatings for use on military aircraft prior to implementation on flying systems. The process, which includes laboratory tests, outdoor environmental exposure and aircraft trials, can be extensive and expensive. However, material qualification is a necessary risk-reduction activity for Air Force systems. The CorRES system produces a more comprehensive set of data for researchers than current corrosion testing systems through the use of a set of sensing elements that can measure free and galvanic corrosion, coating barrier properties and the effects of the environment on coating materials in a single testing platform. Not only can the system be used in the laboratory environment, but it is also able to collect test data at outdoor exposure sites as well. Underperforming coatings can be eliminated from screenings earlier in the testing process, thereby streamlining qualification efforts and reducing the time and costs associated with coating tests. “With this system we are able to get some granularity on performance. For example, you can test 20 primers, and they all may pass, but the pass is with a different degree of success. This will help us to determine which performed the best based on sensing data. We can pinpoint when change happens,” said Hunter. 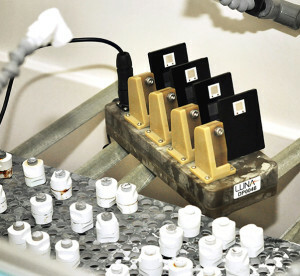 In addition to helping the Air Force to better understand corrosion issues, CorRES platforms are being sought out by industry to better assist their coating evaluation efforts. Users of the system include a leading U.S. aircraft manufacturer, alloy producer, coatings raw material manufacturer, and the UK National Physical Laboratory. In any case, the new testing technology will play a critical role as researchers develop new materials and technologies for aircraft across the spectrum. “Part of our mission at AFRL is to develop new technologies to address technical questions and issues in the field. Multi-sensor panels and systems like CorRES provide us with useful information that can reduce costs as we develop next-generation materials for the warfighter,” said Hunter.